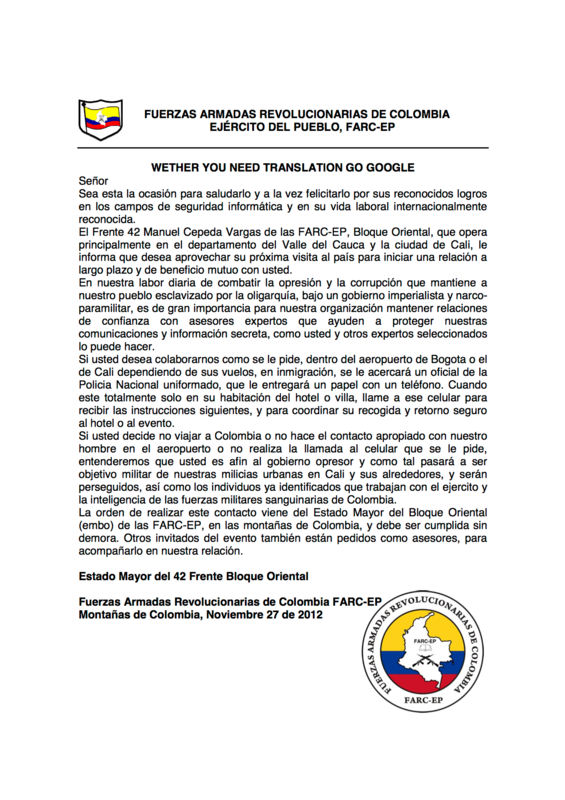 So, woke up this morning to an email claiming to be from FARC (yes – the Colombian militant underground rebel thingy). In preparation to our visit to Colombia next week, they welcome us “experts” and expect us to cooperate with them and help them. Something about being passed a note with a phone number when going through immigration, and calling them to coordinate a meeting. Sprinkled with a little threat that if we choose to ignore it, we are considered cooperating and supporting of the government and as such we are a target. Now, I won’t go through all the mistakes, but seriously? First – using a stupid “fake mailer” domain to send it (emkei.cz), is just very low. Second – the attached PDF has no exploits, no trojans, nothing. At least TRY to humor me. Last – come on, all of the speakers are “foreign”. None of us really speaks/reads spanish that well. Putting a note “Whether you need translation go google” at the top isn’t really showing a lot of investment from your end. The least you could do is get someone who speaks English to help you a bit. Although we won’t have the red-team class next week, I highly suggest whoever tried this to spring up the money and fly to The Hague for the NCSC Conference in January for our red-team class. 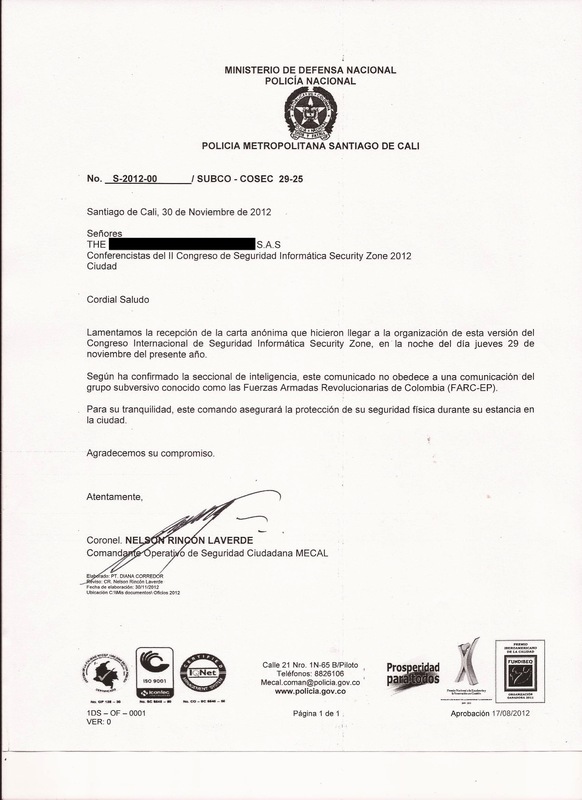 Update – December 1st, 2012: The Colombia National Police and Ministry of Defense have issued a letter stating that after investigating the issue, and working with the intelligence group, they have reached the same conclusion – this is NOT a letter that FARC has produced (duh – FARC would have done a much better job! ), and is a fake. There is obviously no risk to the recipients of the letter. See you all in Colombia in a couple of days! Update – December 10th, 2012: Well, we obviously made it back. No one handing any of us a piece of paper at the airport (and I’ve been through two, and trust me I tried ;-)). No one threatening, or suggesting we should work for them (other than a great business dinner we had). Overall, this is the stuff that hoaxes and prejudice are made of. I guess that for laypersons this would be a big deterrent to showing up in a country that had its name smeared as much over a long time. For someone who has already experienced Colombia and knows something about security – not so much. Just as an anecdote – attaching the letter that the national police has sent the organizers following the threat.